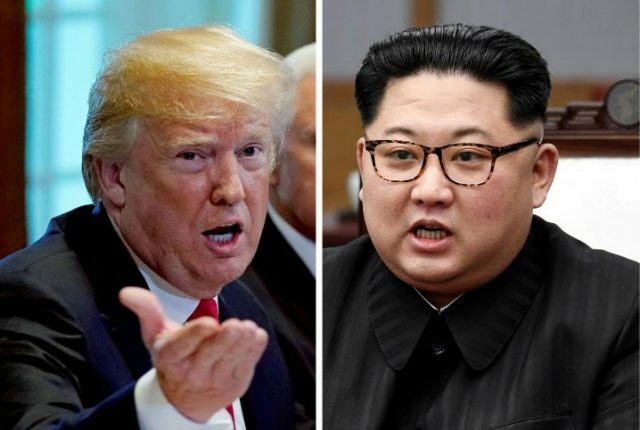 US President Donald Trump Wednesday congratulated himself on his summit with North Korean leader Kim Jong Un, insisting that country is no longer a nuclear threat. The remark was part of a blast of tweets that Trump fired off even as Air Force One touched down at Joint Base Andrews in Maryland outside the US capital and brought Trump back home. He waved as he walked down a red-carpeted staircase and got into a limousine. Trump hailed the summit in Singapore with Kim, in which the the North Korean leader agreed to work towards denuclearizing his country, although their agreement did not say how this would be done. Trump has been criticized for lending legitimacy to the North Korean dictator, whose regime has an atrocious human rights record, by attending the meeting in Singapore. “Just landed – a long trip, but everybody can now feel much safer than the day I took office. There is no longer a Nuclear Threat from North Korea. Meeting with Kim Jong Un was an interesting and very positive experience. North Korea has great potential for the future!,” he wrote. “Before taking office people were assuming that we were going to War with North Korea. President Obama said that North Korea was our biggest and most dangerous problem. No longer – sleep well tonight!” Trump added. Trump also praised himself for backing a woman who won a Republican primary Tuesday in South Carolina, defeating a Trump critic.